When former Bachelorette Desiree Hartsock walks down the aisle to say "I do" to fiance Chris Siegfried in summer 2014, she&apos;ll do it in a somewhat expected fashion: She&apos;ll wear a custom bridal gown that she designed! Keeping her wedding date under wraps, Hartsock did hint to Us Weekly that she is currently codesigning not one but two dresses with label Maggie Sottero for her big day: A "timeless, yet surprising" silhouette for the vows and a "1920s-inspired" reception frock. "I can&apos;t wait for Chris to see me in all the dresses!" the bridal stylist — who moved from her native Colorado to Seattle to be with Siegfried — says of her mortgage broker man. Moving forward with the rest of her wedding planning shortly after accepting Siegfried&apos;s proposal on season 9 of The Bachelorette, Hartsock, who creates gowns for clients from her home, didn&apos;t start designing her own masterpiece until much later. 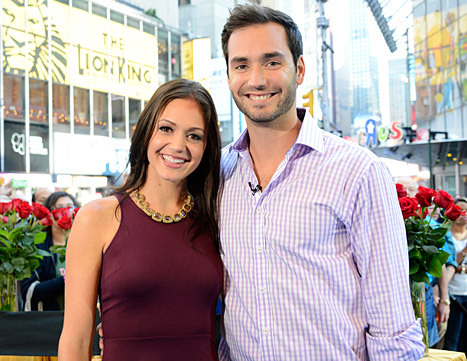 While many Bachelor and Bachelorette contestants have televised their wedding — including Hartsock and Siegfried&apos;s Seattle neighbors Jason Mesnick and Molly Malaney, Hartsock tells Us she remains undecided about the scale of her nuptials. "I think I want it to be more low key than people are expecting — a small ceremony — and just the essentials," she predicts. "I&apos;m just excited to be designing my dress!"